Well, let’s take you through what’s going on. And we should note, there’s a BNN connection to this story. First, the basics: antitrust regulators in the U.S. are reportedly pushing AT&T to divest certain assets to get the deal approved, with much of the focus being on Time Warner’s turner television unit. That division includes CNN. And it’s no secret U.S. President Donald Trump has had a war of words with that network. When the deal was announced in October of 2016, BNN spoke with antitrust expert Makan Delrahim. That interview took place before Trump was elected President; it was also before Delrahim went on to work for President Trump in the White House as deputy counsel. And it was also before Delrahim was selected to lead the Department of Justice’s antitrust unit – a role he officially took in September, when he was confirmed by the senate. Which means that Makan Delrahim is now the antitrust chief in the U.S. - which means he is now the point person on the AT&T-Time Warner deal. And his only public comments on that deal… came in that BNN interview. Those comments have become ammunition for AT&T, which has made it known it believes any divestitures associated with the deal – particularly CNN – would be based on political motivation, as opposed to antitrust issues. 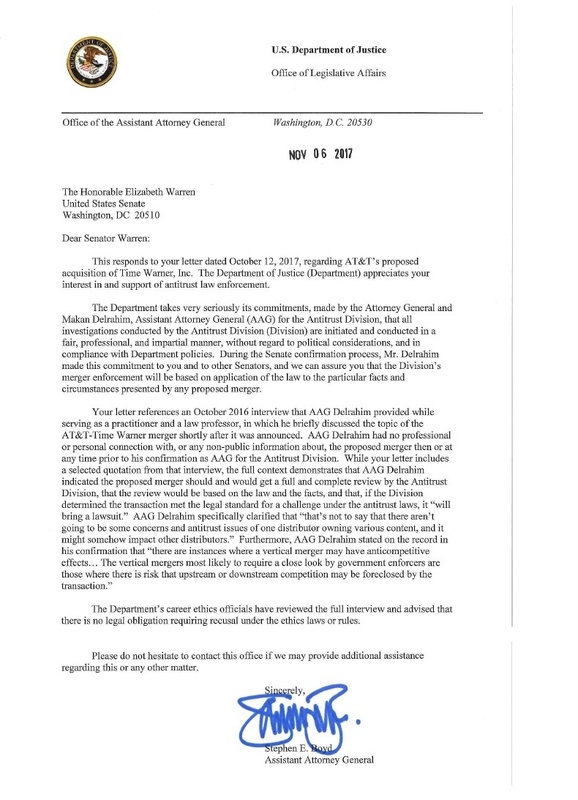 On top of that, U.S. senator Elizabeth Warren has already asked Delrahim to recuse himself from the AT&T review because of his comments in the BNN interview.